English is now international language of inter-communication between nations at global level. It is, practically, the official language of Pakistan. In our country routine work, agreements and documentation is usually done in English in government as well as private sector. Be it Court decisions, Bank documents, Medical Reports or Official Educational and other Certificates, Accounting or emails, English is used every where. Therefore, schools have adopted English as medium of education. By and large, all scientific, business, management, arts and other fields of education use English as medium of communication and teaching. Unfortunately in English medium, focus is only on teaching syllabus in English. Hardly any dedicated effort is used to better the handwriting of students. In some schools handwriting improvement is tried through Writing Series. It is, however, observed that this effort does not offer required results in the absence of an expert. 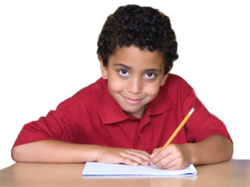 Therefore, handwriting of majority of children is usually very bad and it remains the same for rest of their lives. In schools, normally all subjects, except Urdu and Islamic Education, are taught in English, and students write English 70% to 80% of the time. 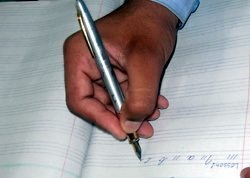 Need of the hour, for both teachers and parents, is to try to improve Urdu and English handwriting of the students. Like all Arts subjects, Hand Writing is a specialized subject. This, like any other subjects, can not be done without a teacher. It is also observed that many good students do not have good handwriting skills despite securing good positions in their career. More worrisome is the point that teachers too did not have good handwriting themselves! It is a practical observation that sometimes even the students can not read clearly the handwriting of the teachers on black boards. It is, therefore, imperative to start proper syllabus-based handwriting training for students as well as teachers. By the Grace of Allah, Art Point School of Calligraphy and Fine Arts is imparting such raining in Urdu, English and Arabic for last ten years in Karachi. A step-wise syllabus has been prepared under the supervision of very experienced teachers. Hundreds of students, professionals and teachers have so far been benefited from these syllabus and are performing much better than before in their respective fields. The most beneficial are the students, who have not only improved their handwriting but also got better marks. Some students even have got Special Certificates on their handwritings. For the benefit of students and teachers, an easy to implement, step-wise syllabus has been prepared to improve the handwriting of anyone who wants it. Special Training Workshops are arranged for teachers . One of the most commonly used and famous handwriting patterns in the world i.e. Cursive and Slanting is being taught in this syllabus by Art Point. In the first step practice is done to write and then join Small alphabets. Afterwards same exercise is done for Capital letters. Gradually training is imparted for words, sentences and paragraphs. Grip the pen at right position and style. Writing words in proper required style/shape. Pencil, fountain pen or pointer. Four lines copy or paper. Right postures while sitting for writing. Sufficient distance between paper and eye. Try to make correct shapes of given words. Keep trying difficult words shapes. Always use pencil, fountain pen or pointer. Don't rush while writing. Be patient. Pause between words. Do exercise daily as a routine. Have proper spacing between words and always write on a line. Pay heed to teacher's advice and try to practice them. Copyright © Handwriting.pk - All Rights Reserved.